Welcome to the first sew-along of the new year! The first sew-along will not be from my Japanese sewing books collection, but a long overdue project that I’ve been meaning to do for my other blog Cotton Candy. The Girls’ Qi Pao (pronounced ch’i-p’ao), also known as the Cheongsam or the Chinese Dress. I made this particular dress last year as part of racial harmony day celebrations in school, and posted it on my Cotton Candy blog. It was requested by a number of readers who wanted to make this for their girls. I got the patterns drafted but never had time to get around to actually making it again. Then someone reminded recently that Chinese New Year was approaching so I better hurry up! I’ve just finished putting the patterns together, and now I just need to sew, take photographs (and take a video if I can) of the steps, which I will do so over the next few days as part of the sew-along. 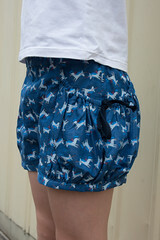 – The patterns I have drafted are based on the sizes in (Metric Pattern Cutting for Children’s Wear and Babywear ). I will attach the size chart in the post tomorrow for your reference. The sizing is based on height and average proportions as provided in the book. The ages for the corresponding heights given in the book are approximated based on average data, so when deciding which size to make, it will be better to take measurements of your child rather than following the height dimension alone. – Also know that this is a midi dress dress (ends middle of calves) and also quite fitting. It is not tight-fitting like the original ladies version, as I have added some ease for the comfort of children but neither is it meant to be baggy or shapeless. As for the length, you can adjust it as you see fit. – Because the textbook proportions may not be perfect for everyone, I suggest you make a muslin / test piece out of cheap fabric first to test for fit and make adjustments, especially if you are going to use expensive fabric. 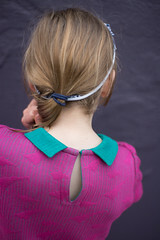 – The younger children may not like the fitting collar, so you can want to modify the collar a little or move the decorative buttons lower down (lying on the bodice instead of the collar as shown in my photo) so that it is not too restrictive. – I will be making the dress in Chinese brocade but you can also make it in silk/cotton, or any other fabric you fancy. Get creative and have fun! Day 1 ( 14 Jan, Tuesday)- Download PDF patterns, assembly of PDF patterns and Preparation of Materials. 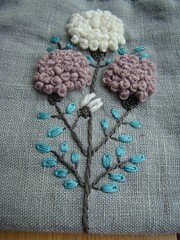 Please join me in the sew-along! Or bookmark this page for future sewing reference if you don’t have time to join in now. I will be adding links to the above scheduled posts as we go along, so you can always access all the necessary pages from this main page. That’s all for today. See you tomorrow for the sew-along! It looks lovely – how much fabric do you think I’d need to make one for a 5-year-old? I’ll try it, thanks for your work! Hooray! I can’t wait for the sew-along! We will be going back to Malaysia for Chinese New Year this year and I really want to make Little M some cheongsam! Thank you for sharing the girl’s qipau sewing pattern. I was looking to make one for my daughter, Naomi, who will be 5 in July. It came out very nice. I added a short sleeve and lengthen the dress by 2 inches. She loves it so much. I am so glad I have found your blog – my daughter would like me to make this dress with a gathered skirt for her 1 year old daughter. Do you have a scaled down version for a much smaller child? I really like the zipper at the back, but am a little daunted by the collar. Can you give me some guidance, as I am a tentative sewer. love your work and thank you, thank you for the pattern and sewing guide. I had a rough experience with a slasegirl when I was trying to buy a cheongsam for my little girl. This is such a lovely idea, to sew one for her myself. Will invite you to take a look at my efforts if it’s good enough! My granddaughter is a bit on the chunky side , but I would still love to make her one . Since she is a girly girl that live Chinese styles (martial arts as well) I know she would love it. You can try a larger size (use the chest size to decide which size to make) and then shorten the length if it is too long. Please share to me, many thanks. Can someone help me find the beautiful colored frogs used on this dress shown. I can’t find them online anywhere and here in MN I can’t find the pretty colored ones in the store.